How do you boil water? 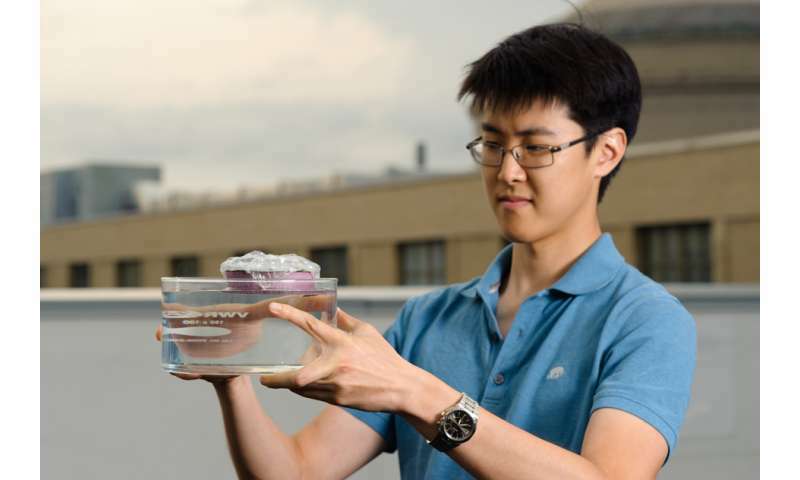 Eschewing the traditional kettle and flame, MIT engineers have invented a bubble-wrapped, sponge-like device that soaks up natural sunlight and heats water to boiling temperatures, generating steam through its pores. The design, which the researchers call a "solar vapor generator," requires no expensive mirrors or lenses to concentrate the sunlight, but instead relies on a combination of relatively low-tech materials to capture ambient sunlight and concentrate it as heat. The heat is then directed toward the pores of the sponge, which draw water up and release it as steam. From their experiments—including one in which they simply placed the solar sponge on the roof of MIT's Building 3—the researchers found the structure heated water to its boiling temperature of 100 degrees Celsius, even on relatively cool, overcast days. The sponge also converted 20 percent of the incoming sunlight to steam. The low-tech design may provide inexpensive alternatives for applications ranging from desalination and residential water heating, to wastewater treatment and medical tool sterilization. The team has published its results today in the journal Nature Energy. The research was led by George Ni, an MIT graduate student; and Gang Chen, the Carl Richard Soderberg Professor in Power Engineering and the head of the Department of Mechanical Engineering; in collaboration with TieJun Zhang and his group members Hongxia Li and Weilin Yang from the Department of Mechanical and Materials Engineering at the Masdar Institute of Science and Technology, in the United Arab Emirates. The researchers' current design builds on a solar-absorbing structure they developed in 2014—a similar floating, sponge-like material made of graphite and carbon foam, that was able to boil water to 100 C and convert 85 percent of the incoming sunlight to steam. To generate steam at such efficient levels, the researchers had to expose the structure to simulated sunlight that was 10 times the intensity of sunlight in normal, ambient conditions. "It was relatively low optical concentration," Chen says. "But I kept asking myself, 'Can we basically boil water on a rooftop, in normal conditions, without optically concentrating the sunlight? That was the basic premise." In ambient sunlight, the researchers found that, while the black graphite structure absorbed sunlight well, it also tended to radiate heat back out into the environment. To minimize the amount of heat lost, the team looked for materials that would better trap solar energy. In their new design, the researchers settled on a spectrally-selective absorber—a thin, blue, metallic-like film that is commonly used in solar water heaters and possesses unique absorptive properties. The material absorbs radiation in the visible range of the electromagnetic spectrum, but it does not radiate in the infrared range, meaning that it both absorbs sunlight and traps heat, minimizing heat loss. The researchers obtained a thin sheet of copper, chosen for its heat-conducting abilities and coated with the spectrally-selective absorber. They then mounted the structure on a thermally-insulating piece of floating foam. However, they found that even though the structure did not radiate much heat back out to the environment, heat was still escaping through convection, in which moving air molecules such as wind would naturally cool the surface. A solution to this problem came from an unlikely source: Chen's 16-year-old daughter, who at the time was working on a science fair project in which she constructed a makeshift greenhouse from simple materials, including bubble wrap. "She was able to heat it to 160 degrees Fahrenheit, in winter!" Chen says. "It was very effective." Chen proposed the packing material to Ni, as a cost-effective way to prevent heat loss by convection. This approach would let sunlight in through the material's transparent wrapping, while trapping air in its insulating bubbles. "I was very skeptical of the idea at first," Ni recalls. "I thought it was not a high-performance material. But we tried the clearer bubble wrap with bigger bubbles for more air trapping effect, and it turns out, it works. Now because of this bubble wrap, we don't need mirrors to concentrate the sun." 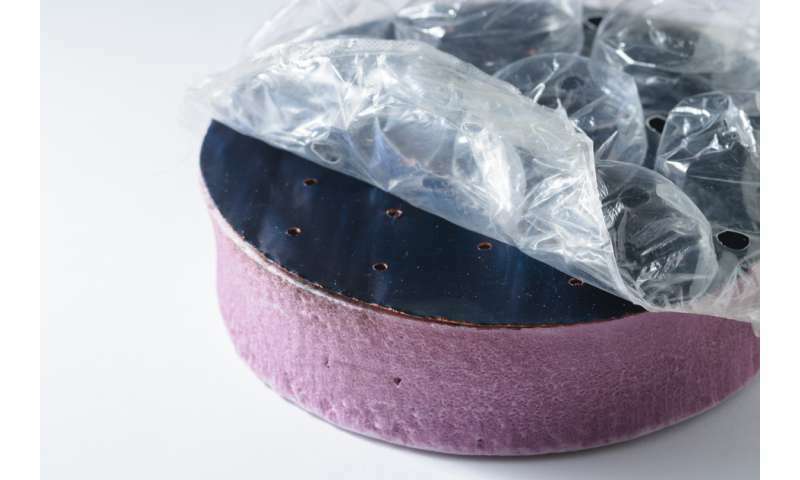 The bubble wrap, combined with the selective absorber, kept heat from escaping the surface of the sponge. Once the heat was trapped, the copper layer conducted the heat toward a single hole, or channel, that the researchers had drilled through the structure. When they placed the sponge in water, they found that water crept up the channel, where it was heated to 100 C, then turned to steam. Chen and Ni say that solar absorbers based on this general design could be used as large sheets to desalinate small bodies of water, or to treat wastewater. Ni says other solar-based technologies that rely on optical-concentrating technologies typically are designed to last 10 to 20 years, though they require expensive parts and maintenance. This new, low-tech design, he says, could operate for one to two years before needing to be replaced. "Even so, the cost is pretty competitive," Ni says. "It's kind of a different approach, where before, people were doing high-tech and long-term [solar absorbers]. We're doing low-tech and short-term." "What fascinates us is the innovative idea behind this inexpensive device, where we have creatively designed this device based on basic understanding of capillarity and solar thermal radiation. Meanwhile, we are excited to continue probing the complicated physics of solar vapor generation and to discover new knowledge for the scientific community," Zhang says. "converted 20 percent of the incoming sunlight to steam"